Minisceongo Creek Utility Restoration - West Haverstraw, N.Y. The GenOn Blowline Power Generation plant was severely impacted by Hurricane Irene in 2011 causing extensive damage to the local area. One of the impacts was to Minisceongo Creek where erosion and embankment failure exposed critical utilities including a 16” and 24” gas line and 4 -10” electrical lines. OCS Industries Inc, contracted Jett Industries, to encase the existing 16” and 24” gas lines as well as the four 10” electrical lines running beneath the Minisceongo creek designed by Paul C. Rizzo Engineering. 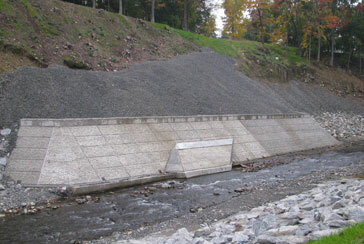 Our work included placing/encasing the existing gas and electrical lines running through the Minisceongo Creek, forming/placing a protective 600 liner foot concrete abutment around the existing gas and electrical lines, placing grout in rip rap upstream and downstream of the abutment for shore line protection. To expedite the on-site construction, the abutment concrete form work was pre-assembled including the ornamental finish panels and shipped to site. Crews performed an off -site mock-up of an abutment section in order to determine the most effective and efficient method of concrete placement to maximize on site production. This was a 12 week project in which the critical onsite work was completed in 30 days to meet the Owners deadline.